According to BYD, one charge can last almost 300km and can, therefore, respond to the demands of a full day's operation. With a passenger capacity of 250 people, it is the longest fully electric bus in the world (seemingly previously at 24m) and can travel at a maximum speed of 70km/h, it’s claimed. Additionally, it is also the world's first electric bus equipped with a distributed four-wheel-drive (4WD) system, which can switch between two-wheel-drive (2WD) and 4WD smoothly to meet the demands of different terrains - while also lowering the vehicle's overall energy consumption, the company states. 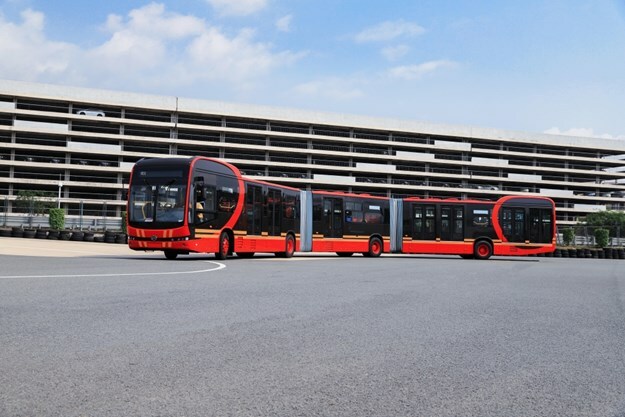 The BYD K12A is compatible with the global Bus Rapid Transit (BRT) system - traditionally the domain of CNG or diesel buses - featuring an all-aluminium alloy body and BYD's core technologies of batteries, electric motors and electronic controls, it explains. "Today, BYD once again uses its core technology, reliable products and innovative solutions to solve the two great urban ills of congestion and pollution," said Stella Li, senior vice president of BYD. "The K12A will bring zero emissions to BRT systems, allowing passengers to enjoy quiet, pollution-free travel while at the same time saving significant maintenance costs for operators." The K12A follows more of BYD's "fine traditions", including its battery heat-management system, energy regenerative system and smart integrated design. The bus is equipped with DC and AC charging ports that can be switched freely to meet customers' every need, BYD states. One charge can last almost 300km and can, therefore, respond to the demands of a full day's operation, apparently. "I’m confident that BYD's super-long pure electric buses are the future of BRT systems, and that the company's strength is a measure of China's solid industrial strength," said Luis Carlos Moreno, CEO of Express, one of the BYD's major clients in Colombia. "On this trip to Shenzhen, I’ve seen that the city's public buses are already 100 per cent electrified and I firmly believe that electrification is a future global trend." 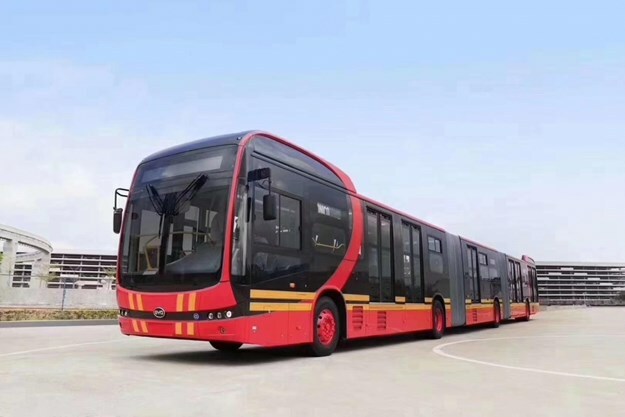 BYD first unveiled its public transportation electrification solution in 2010, soon taking the lead in the field of pure electric buses across China, it states. The scheme has now been upgraded to one of China's national strategies. 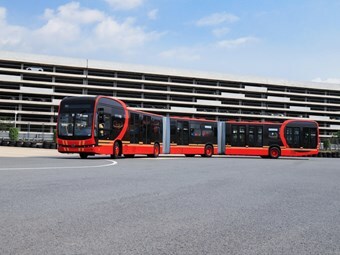 BYD's K9 - the first pure electric bus in the world that boasts multiple certifications from authoritative European, US and Japanese agencies, the company confirms - began commercial operations in Shenzhen as early as 2011. BYD's pure electric buses are noted for their performance in energy-saving and environmental protection, features that the K12A is especially efficient in, it explains. 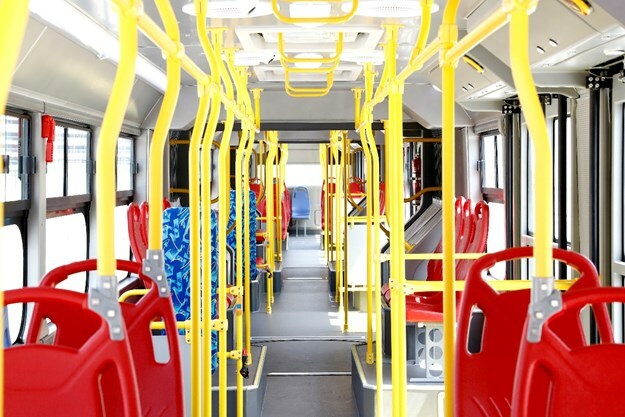 Each bus saves the equivalent of 80 tonnes of CO2 emissions per year and can save 360,000 litres of fuel throughout its lifecycle, the company says. To date, BYD has delivered a total of more than 50,000 pure electric buses to its global partners. In particular, its pure electric buses (longer than 10m) rank No.1 worldwide in terms of total sales, holding a dominant share in the pure electric bus market in the US, Latin America and Europe, it states. To respond to a great surge in orders across the globe, BYD is building a more complete R&D and production presence, and has set up factories for pure electric commercial vehicles in China, the US, Brazil, Hungary and France. BYD's new energy vehicles have led the world in sales 2015-2018 and are operating in more than 300 cities covering in excess of 50 countries and regions across all six continents.